We always talk about breaking through that wall. We don’t run up to the wall and give up, we have to break through the wall and see what’s on the other side." 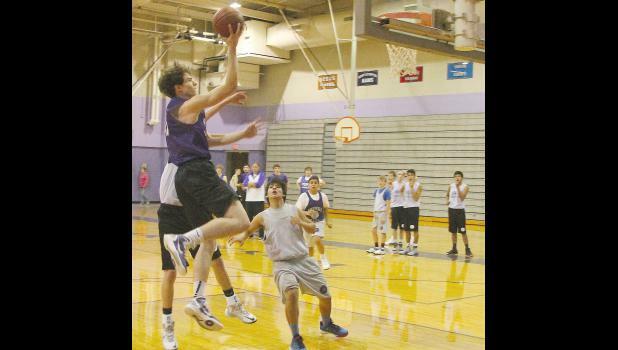 In the past two seasons, the Royal Valley boys basketball team has been knocking on the door of some next level success. A year after an upset victory that pushed them into the sub-state semifinals, the Panthers followed that up by coming one win short of reaching the state tournament last season and finishing the year 10-12 overall. The Panthers had their collective hand on the doorknob and this year they are looking to finally cross over that threshold. “We always talk about playing better as the season progresses and playing our best at the end of the year. We’ve done that the last couple years, we just have to get over the hump,” RV coach Keith Pelton said. Royal Valley will have to do that this year without the help of five key seniors who helped push the team to the brink last season. The Panthers will still have two starters returning and a bunch of juniors who made contributions when asked a season ago. In addition, the players coming back fall more into Pelton’s vision of a defensive-oriented team, which he believes could help make up for the loss of those key contributors to graduation last spring. Senior Tristan Tessendorf and junior Noah Rottinghaus are the two starters returning to the team, while role players like Jarrett Roy, Joe Cullen, Kwaki Spoonhunter and Derrick Barger are back as well. So far in practice, Pelton said seniors like Tessendorf and Cullen have been leading by example, while the juniors have taken on a more vocal leadership role for the team. Even in that role, they are pointing back to the example set by the seniors and Pelton noted they are also fostering some competitive practices that he sees as a benefit. Along with being a competitive group, Pelton noted this is a tight-knit squad that spent a lot of time together over the summer. While he said that could be a key to the team’s success this winter, he also noted the Panthers will need to be focused on playing intense defense and smart offense, though he said the team should be served well be its overall toughness. “We just have to battle through some of the inexperience early and rely on that toughness and take some pride in that. We talk about us being better prepared, being in better shape and tougher than the opponents we face. That’s hard to do in this league because a lot of the teams are the same way, so we have to figure out a way to separate ourselves and do more than what the other team’s are willing to do and I think these kids are going to buy into that,” Pelton said. The Panthers’ entire schedule this season is almost all Big Seven competition and Pelton emphasized that it is not a league to be taken lightly, with no guaranteed wins, so the Panthers will need to be tough and be able to fight each night out. Early on, the team has shown a knack for that as Pelton said the players’ favorite drill in practice is the “charge drill,” which is a defensive drill focused on stopping drives to the basket and already the little guys are stepping in to take on the big guys while everyone is diving on the floor, staying active and showing a lot of tenacity in the exercise. While Royal Valley has some players battling nagging injuries at the start of the season, Pelton believes that is just one more thing that could help the team in the long run as it creates some depth and versatility with other players taking on different roles early on to make up for those missing players. It’s the coach’s job to see the big picture and while coaches always want their teams to strive for things like league titles and state tournament berths, being able to achieve that boils down to a goal as simple as getting better every game and that is what Pelton is looking for out of this team. If the Panthers’ strong core of experienced players can continue to progress and improve throughout the season, they may no longer be knocking but instead entering into that next level of success.